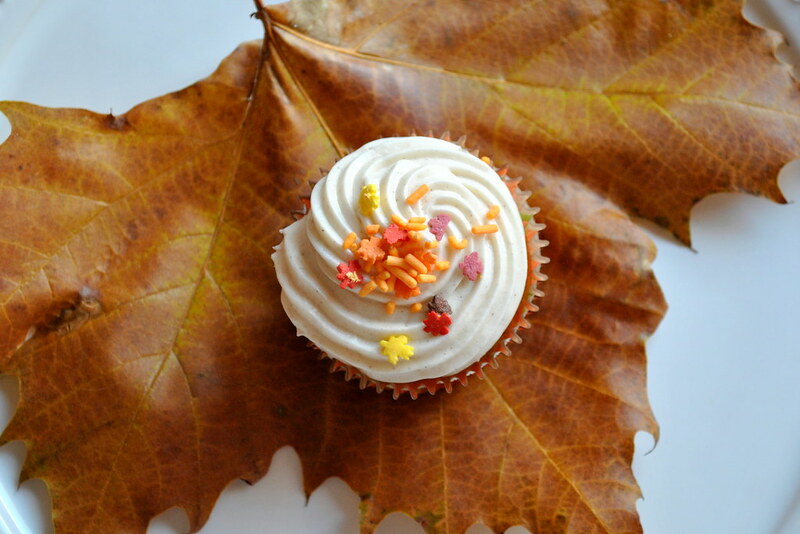 How about subbing out pumpkin pie this year for brown butter pumpkin cupcakes with cinnamon cream cheese icing and adorable leafy fall sprinkles? This is honestly one of my absolute favorite cupcake recipes and each time I make them they seem to be a a crowd pleaser so I think it's safe to say your friends and family will share my opinion. 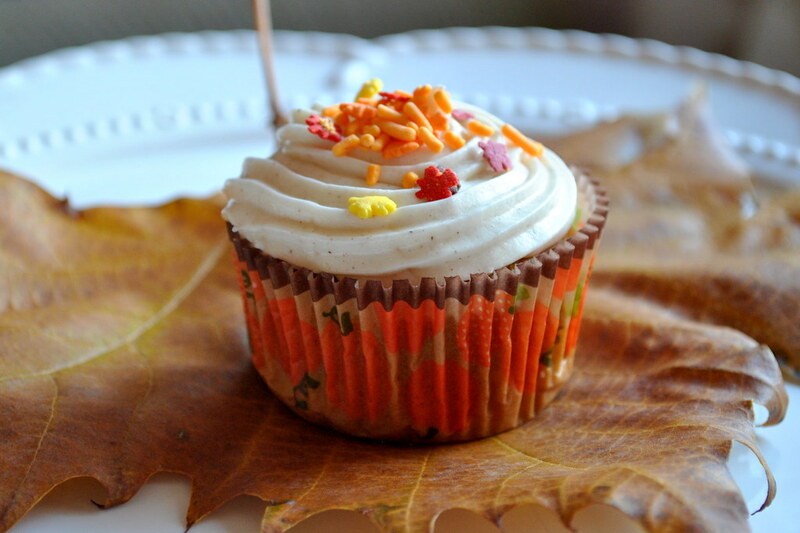 I found these adorable baking cups and fall themed sprinkles at my local party store for extra festivity. I also couldn't resist snatching up one of the gorgeous fallen leaves from the neighborhood to serve as a natural "doily" of sorts. 1. Preheat oven to 325 F. In a pan, melt the butter over medium heat until butter turns brown. Skim foam from top, and remove from heat. Pour into a bowl and leave any burned sediment behind. Let cool. 2. Whisk together flour, baking powder, salt, cinnamon, nutmeg, (ginger), and cloves. In another bowl, whisk together the pumpkin puree, both sugars, eggs, and brown-butter mixture. Gradually add the dry ingredients to the wet until until completely blended. 3. Bake for about 20 minutes. 1. Beat butter and cream cheese together until fluffy then add in salt, vanilla, cinnamon until well combined. 3. Pipe onto cupcakes after they have fully cooled. Currently Coveting is also on Twitter, FB, Instagram, Bloglovin, and Pinterest. Collaboration and sponsorship answers here. that cupcake is adorable and oh so festive!! This looks and sounds delicious! 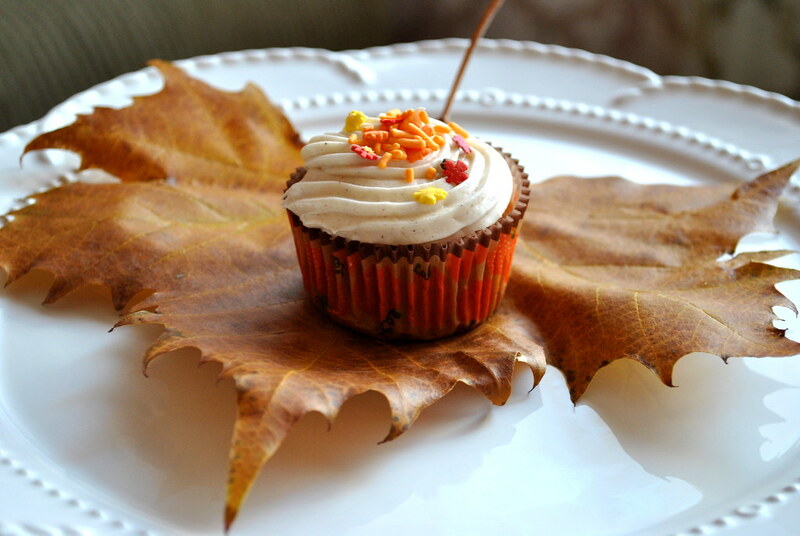 Love the idea of adding cinnamon to the cream cheese frosting for a festive spin! I might have to make this in addition to my other Thanksgiving goodies! cupcakes are my weakness! these look so yummy and festive!! I love those little sprinkles. So cute!